Thirteen years ago, following a great pregnancy, I became a mom via an emergency C-section. I didn’t know this at the time, but my baby girl’s heart rate wasn’t fluctuating during contractions. After spending time in the NICU at a local children’s hospital, visiting several doctors and doing research, it was determined that my beautiful daughter, Lizzy, was going to be delayed. Lizzy was profoundly mentally disabled (PMD). 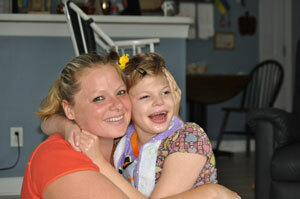 Lizzy has cerebral palsy (CP), an incurable and permanent condition that affects the brain. Lizzy has seizures and she drools because her brain doesn’t tell her to swallow. For months, I pulled away from everyone. I was mad and my anger eventually turned to horrible sadness. I felt like the daughter I dreamed about and hoped for was dead. I was so depressed. My marriage to my husband, Damon, a high school teacher and football coach, suffered. I felt like I had done this somehow. But when Lizzy began smiling at 12 months, I started feeling differently. She’d come off of some strong seizure medicine and started acting like a baby. Eventually, I began telling myself that Lizzy was perfect and I wouldn’t want her any other way. In 2002, I had another daughter, Emily. Lizzy was almost 3 and was our “special needs” child. I found it difficult to accept that Emily was meeting all the milestones that Lizzy wasn’t. Every time Emily hit a milestone that Lizzy didn’t, it felt like a punch in the gut. But, life had to keep going forward. I learned to grieve those milestones and move on. By the time my son Jack was born in 2007, Lizzy was 8 and had just learned to walk. I felt like I had two babies. Both in diapers, both spoon fed, and both in strollers. We didn’t go out much. I have no clue where our energy came from. 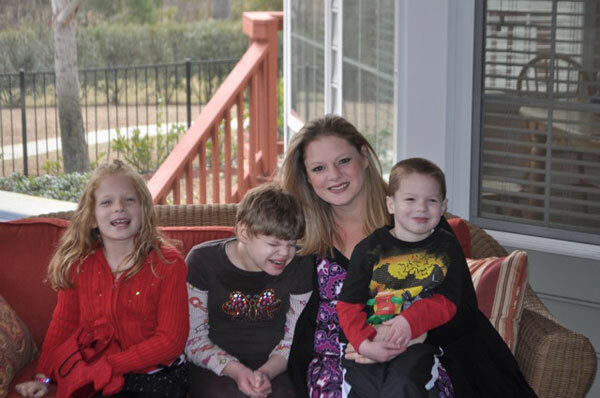 I’m a stay-at-home mom and a parent advisor for the CP Family Network, a website to help empower CP families. Damon is a hands-on dad — he has to be in order for this family to function. Our two younger ones are into sports and Lizzy comes with us to practices and games. Lizzy is a happy girl — she loves music and snuggling. She depends on us 100 percent of the time. We get lots of looks and questions about Lizzy — she often draws attention by squealing loudly. She has seizures that are not completely controlled with medicine. She doesn’t chew so all meals have to be soft and easy to swallow. She is legally blind so she needs help with walking. She’s mostly nonverbal — though she recently said “Mama” — and she’s still in diapers. Lizzy likes and needs to have a routine. She attends middle school with adapted hours. She goes to school at 9:00 and I pick her up at 3:00. She takes a two-hour nap when she gets home from school and is back in bed by 8:00 p.m. Her room is filled with baby toys that vibrate, light up or play music. Lizzy may not know what is going on around her, but she has a heart and she needs respect just like any other human being. Lizzy’s love language is touch. Hugging or wrestling, it doesn’t matter, she loves both. One thing that I’ve really tried to do with my other two kids is spend time with each of them, alone. My biggest fear is Emily or Jack growing up and resenting me for giving Lizzy all the attention and barely any to them. Emily and Jack have learned a lot about a “special needs” life. They are more aware of other kids with needs. They aren’t afraid of them. That warms my heart more than anything. I know they would stand up for these kids. My kids have learned patience and it’s something that I really only learned when I had Lizzy. We feel blessed to have Lizzy in our family. Lizzy’s touched more lives in her short 13 years than I have in almost 40! Lizzy has taught us compassion, unconditional love, and the understanding that things could be worse.